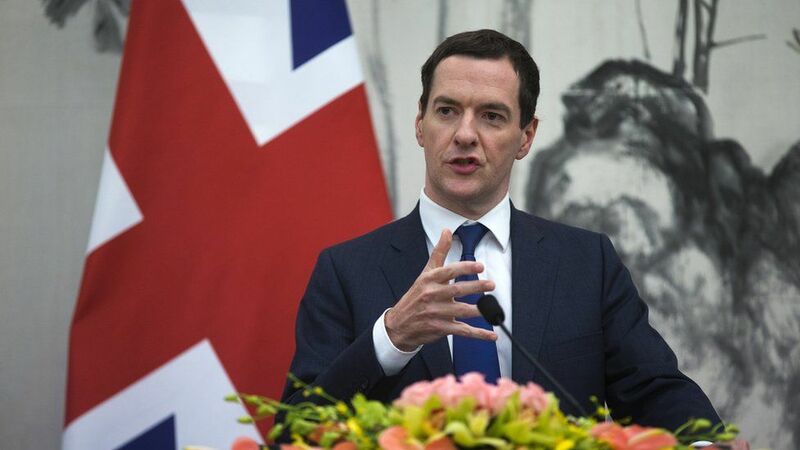 Chancellor George Osborne has said the UK and China are exploring how to link their stock markets. He announced a “landmark feasibility study” into the idea, which would enable Chinese and British shares to be traded in both countries. He said the UK and China would “stick together”, despite stock market turmoil and faltering economic growth in the world’s second-largest economy. Mr Osborne made the pledge in a speech at the Shanghai Stock Exchange. He described the exchange as the “epicentre” of the recent volatility in global markets. The exchange’s benchmark index has fallen nearly 40% since June. The chancellor is visiting China to boost commercial and political ties. His trip comes ahead of a state visit to the UK by Chinese President Xi Jinping in October – the first by a Chinese leader for 10 years. China recently revised down its 2014 growth figure from 7.4% to 7.3% – its weakest showing in nearly 25 years. For this year, the government is targeting annual economic growth of about 7%. Growing evidence that the world’s economic powerhouse is slowing down has caused major investment market falls. “Whatever the headlines, regardless of the challenges, we shouldn’t be running away from China,” said Mr Osborne, adding that he “very deliberately chose” the location of the stock exchange to send out his message. He said the two countries should work together to make the UK “China’s best partner in the West”. “I want to see our stock markets in London and Shanghai formally connected, with UK firms raising funds from Chinese savers, and Chinese firms listing in London,” the chancellor said. Speaking to BBC Radio 4’s Today programme, the chancellor said China was a “phenomenal part of the world economy” and “a very important part of Britain’s economic future”. He acknowledged concerns about China’s human rights record, saying the countries had two completely different political systems, but added that it was “better to engage and talk about these things” than to “stand on the sidelines”. Mr Osborne’s speech in Shanghai comes a day after he announced that the UK would guarantee a £2bn deal under which China will invest in the Hinkley Point nuclear power station. He said the deal would pave the way for a final investment decision on the delayed project by French energy company EDF. He added it would also enable greater collaboration between Britain and China on the construction of nuclear plants. In other measures announced on Monday, it emerged that the People’s Bank of China is to issue short-term bonds in London denominated in the Chinese currency, the first time it has done so outside China.